If you have bought or are planning on buying a guitar for your child, it is also worth investing in a good gig bag or guitar case. The main reason to get a guitar case is to protect the guitar when transporting it from one place to another although they are also great for storage, as well as giving your child a central location to store whatever guitar books, picks, tuners, and extra strings they may need. Guitar cases come in two main types: gig bags and hardshell guitar cases. A gig bag is generally a padded, soft-sided bag that opens and closes with a zipper. They are often made from Nylon, and usually have shoulder straps, handles, and a few zippered pockets. A hard shell case is generally made of molded plastic, and it has lockable latches rather than a zipper. Gig bags are not as durable as hard cases, but they are lighter and easier to carry. 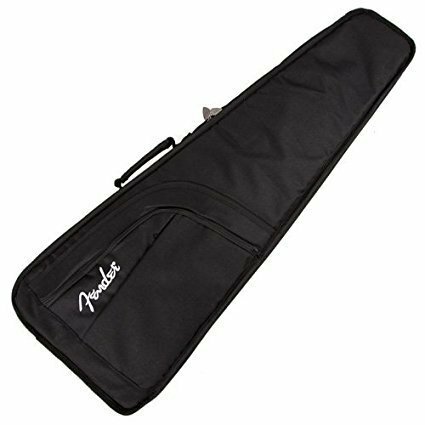 When shopping for a case for a children’s sized guitar, I would generally recommend purchasing a gig bag rather than a hard shell case. One reason for this is that it will be much easier for the child to carry the guitar because the bag will be lighter than a case. The other reason I love gig bags for kids is that they generally have outside pockets so that kids can store all the stuff they need for playing and a lesson in one place. Hard cases do have storage, but if you get the right gig bag, you can get much more storage. In my opinion, the only time you would want to look for a hard shell case for a small child would be if you are traveling on planes a lot, or if the guitar is going to be moving around frequently and there is a good chance that it could be damaged. If you are taking the guitar from home to lessons, a gig bag is best. If you are shopping for a teen that is in a band or wants to join a band, having a hard case is the better option because it does provide a lot more protection, especially if the guitar is being thrown in someone’s van or car. The size of the case is pretty important. A lot of the guitars that we talk about on this site are 1/2 or 3/4 size, so it is a good idea to look for cases that are the same size as the guitar you are buying, or you already own. You don’t want to get a 1/2 case for a 3/4 guitar because it isn’t going to fit. It generally isn’t recommended, but you can get a 3/4 size gig bag (gig bag only not hard shell) for a 1/2 guitar, it may slip around a little in the case, but it will still be protected if you are leaving the guitar at home. That would also apply to a full-size gig bag for a 3/4 guitar, especially if the bag has good padding. If you are purchasing an electric guitar, you should look for a case that is made for electric, ditto for classical and acoustic. There are small, but significant differences in the sizes and shapes of the different types of guitars that could mean that the case that you buy may not fit. There are exceptions to this, but it is best to look for a case that is made specifically for the type of guitar that you have. Padding is a pretty important thing to look for in a gig bag, the more filling, the better for kids. The padding will help protect the guitar and stop it from being damaged. Some gig bags come with almost no padding. As a general rule the more you spend on the bag, the more padding you tend to get. Some bags have Velcro padding on the side that you can adjust, based on the guitar that you have in the bag. For kids, I would look for gig bags that give you a couple of good pocket options. You will want a larger outside pocket that you will be able to fit books (depending on the size of the book). I can’t stress enough how handy it is to have everything all in one place, especially if you have a child who isn’t the most organized. The pockets can usually fit books, tabs that they have printed off the internet, strings, tuners, etc. Most gig bags for smaller guitars have the adjustable backpack style of straps. It is something that you will want to look for in any bag you are buying for kids. It makes it easy for them to carry and there is less chance of them banging the guitar into a door frame or dropping it as they are going to and from lessons. It also leaves their hands free in case they need to carry anything else. If you don’t like the straps, there is usually an option to remove them. One of the best uses for a gig bag or a hard case is for storage. For any long term storage, it should be put in a gig bag or a back. One reason for this is that it will stay in tune better. I’ve had guitars that I have left in the case for multiple years, and when I have taken them out, they are still in tune. That won’t happen if the guitar is left out. The other reason to keep it in the case is to protect it from things like dust or humidity. Humidity and temperature changes are terrible for keeping a guitar in tune. Moisture is also really bad for the wood on acoustic guitars. One caution about keeping the guitar in the case at home, if you are trying to get your kids interested in the guitar, you probably don’t want to keep it in the case all the time at home, because your kid won’t play it – out of sight out of mind. Generally, I would say that the amount you are going to want to pay for the bag or case should depend on how much you have spent or are planning on spending on the guitar. For most children’s guitars, I would look for something in the $30-$50 range. It is a bit of an investment, but it should last for years and will help to keep the guitar in good shape. One of the companies to get a good gig bag for a smaller guitar is Gator. 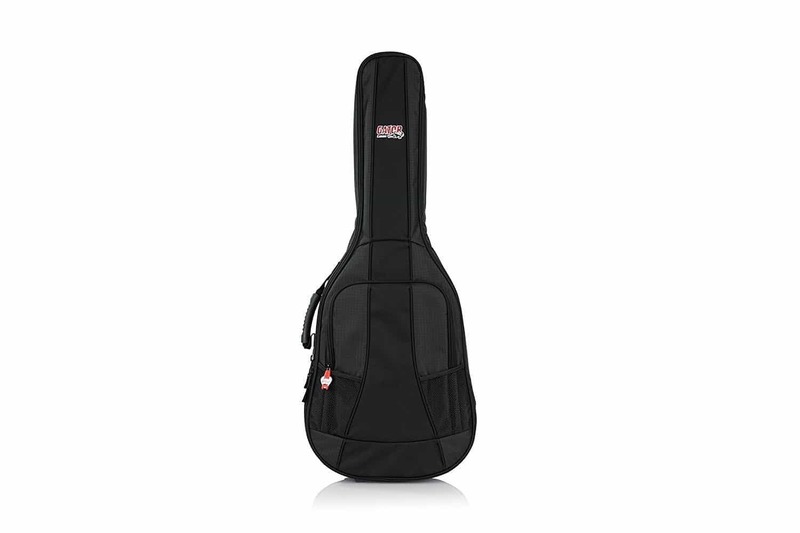 They have a whole range of cases to choose from; in particular they have two different lines are great for mini acoustic as well as mini electric guitars. Their least expensive line is the GBE Economy Gig Bag line of cases. These bags don’t have a tonne of padding, so they work well for lower valued instruments. Their slightly more expensive line is the 4G Series that have thick padding and lots of storage compartments. If you are spending over $100 on an instrument and your child is taking lessons, then you will probably want to look at the 4G Series. Many of the Yamaha student guitars come with really nice gig bags. 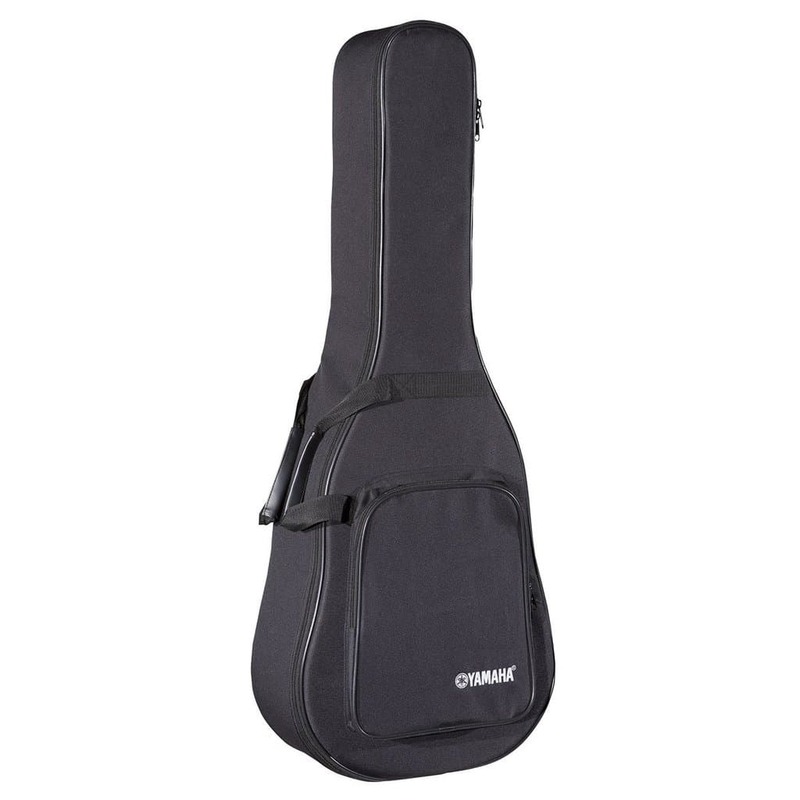 You can also buy bags separately, two of the best are the Yamaha CG2-SC Soft Lightweight 1/2 Size Classical Guitar Case and the Yamaha CG3-SC Soft Lightweight 3/4 & 7/8 Size Classical Guitar Case. Both are soft cases with foam padding that is made to fit classical guitars. They have a nice big pocket on the front and shoulder straps on the back. If you are looking for a bag for a 3/4 size electric guitar, specifically the very popular Squier Mini Strat, this Fender Urban Mini Strat Gig Bag is the one to get. It has a luggage grade exterior with an 11 mm internal foam padding. There are two big outer pockets, and it comes with the backpack style shoulder straps. For those looking for a hard case for a 3/4 size acoustic, in particular, a Baby Taylor or a Little Martin, there aren’t a tonne of options. A good case to check out is this SKB Baby Taylor/Martin LX Guitar Shaped Hardshell. It has reinforced latches, molded in bumpers with EPS foam interiors. They are a little pricey, but they come with a warranty against defects in materials and craftsmanship for the life of the case. If your child is taking lessons and the guitar you have didn’t come with a decent bag, it is worth getting a good quality, padded gig bag. It will protect the guitar, give your child a place to store all of their guitar accessories, and they are great for storing the instrument and keeping it safe from dust and humidity. 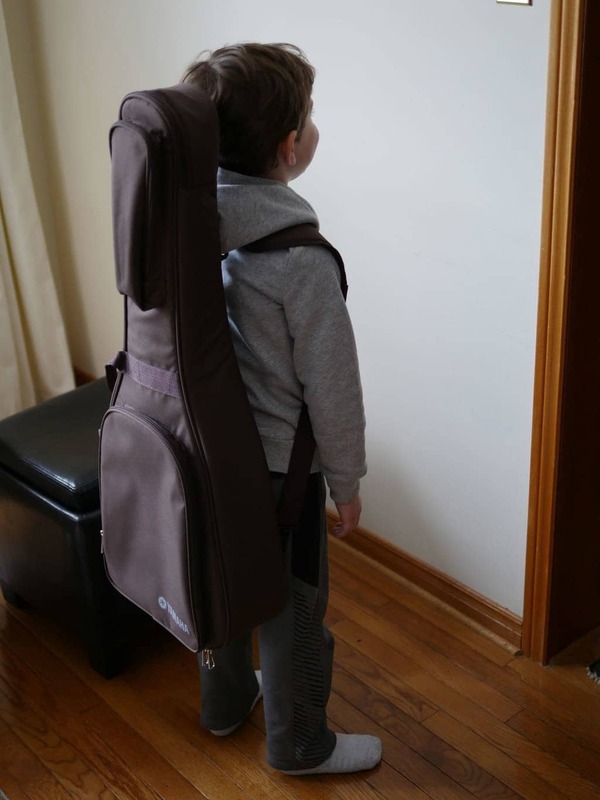 The ideal gig bag for kids has a huge pocket on the outside of the bag, along with smaller storage pockets, a good quality zipper, backpack straps, and a standard handle. On the inside, it will be well padded, and it may have a cushion with a strap to secure the guitar (just in case it is too small).